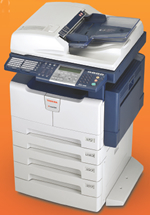 We have a full line of Toshiba copiers for sale or lease. Our sales and service team covers Southern California, Inland Empire, Los Angeles County, Orange County, Riverside County, San Bernardino County. 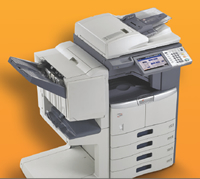 Toshiba understands it’s not about the copier, it’s about solving your business issues. Our people bring innovative, real-world solutions to all your print management needs. We’ll help you cut costs, secure your documents and reduce your environmental footprint. And if there’s one thing every business and our planet can use right now, it’s managing to do more with less. Toshiba e-STUDIO205L/255/305 Series detailed brochure. Click here for more information on the e-STUDIO167/207/237. 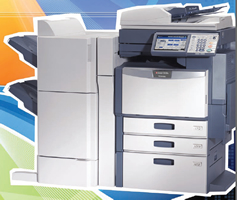 overall capabilities by supporting Direct PC Fax and more. We’ve designed the e-STUDIO167/207/237 devices to be virtually maintenance-free to maximize uptime. The e-STUDIO167 has a first preventative maintenance scheduled at 72,000 impressions and the e-STUDIO207/237 have their first preventative maintenance scheduled at 90,000 impressions. 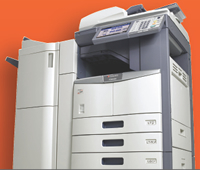 Standard toner yield is 24K impressions, and the cartridges are easy to replace. color systems aren’t just multifunction. Click here for more information on the Toshiba e-STUDIO 233/283. Introducing the finest business decision you can make. 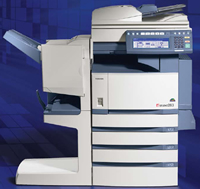 At a time when some businesses are making tough decisions, Toshiba offers a simple one—the e-STUDIO355/455 Series. It streamlines operations and boosts productivity to an all-new level.